From September 19th to 23rd, the leading event on equipment manufacturing in China, the 20th China International Industry Fair (CIIF 2018) took place at the National Exhibition and Convention Center (NECC) in Shanghai. 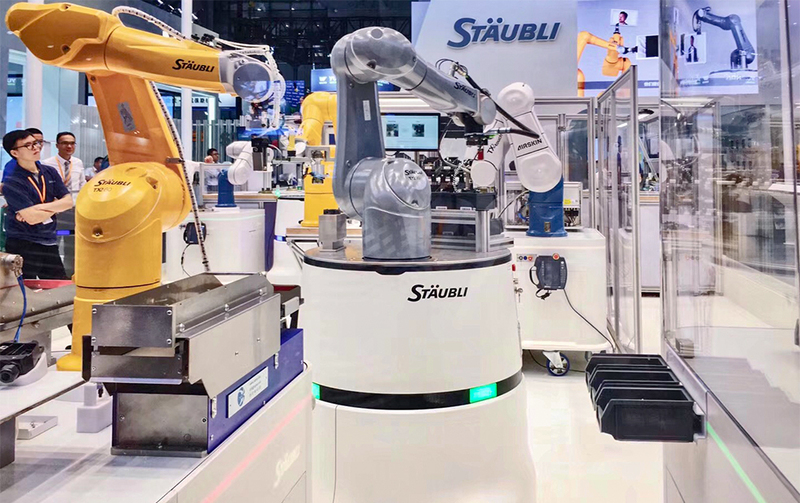 Stäubli presented its latest products and solutions at Booth A131 in Hall 8.1, combining the company’s three divisions – Robotics, Fluid Connectors and Electrical Connectors. In Shanghai, Stäubli showcased a live demonstration of highly realistic Smart Production Line. Here you could marvel at how robots and mobile robot systems produce components for tool changing systems in direct collaboration with human employees in an Industry 4.0 setting. We were showing that Stäubli solutions are capable of realizing the production scenarios of the future today. Stäubli Robotics also held a press conference for the latest TS2 SCARA series premiere at the booth. Thanks to its superior JCS drive technology, the four-axis machines now come with enclosed casing and internal cabling. The result is a superior hygienic design that paves the way for new applications. Nullam sit tristique ut Aenean dolor.